Oh how fickle and strange ‘revolutions’ can be. Perhaps the Western academic world can be forgiven for its presumptuousness: after all, it has been nearly a generation since the dissolution of the Soviet Union and subsequent march of ‘democratic revolutions’ all over the globe. Well, actually, that is partially true. What has erupted all over the globe has largely been the triumph of democratic language: most regimes, whether they truly resemble democratic best practices or not being of a secondary concern, have usually couched their activities in decorative democratic language. Naturally, opposition movements emerge and challenge the status quo by claiming to be ‘more democratic’ or ‘truly democratic,’ thereby setting the stage for the outside world to decide which side is telling the truth more accurately. It is not always an easy choice. Whether it has been in Southeast Asia, Africa, Latin America, Central Asia or the Caucasus, what the world has usually seen is a corrupt and/or dysfunctional regime replaced ultimately by opposition figures or parties that come to be almost as corrupt and dysfunctional, if not more so. The momentous events that have been characterized as The Arab Spring have not led to waves of Arab democracy providing new hope and prosperity to peoples and communities that were down-trodden and ignored. Rather, there has been a grinding inexorable plodding progress, at best, of countries that discovered soon enough that identifying the problems was far easier than actually solving them. In that I suspect Ukraine will be no different, no matter how many elections, reforms, or ‘repositions’ the country goes through. But that is not what is most interesting from an academic perspective. Rather, it is the fairly unique set of structural circumstances in and around the Maidan revolution that can be largely to blame for how poorly things have gone for the Maidan revolutionaries. Consider: most revolutions in the 21st century have been positioned as protests against corrupt regimes, and thus have themselves largely escaped the microscope of political analysis until much later. 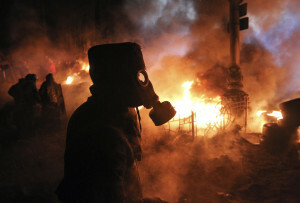 Georgia, Kyrgyzstan, the first Ukraine (the ‘Orange’ one), Egypt, Libya, Yemen, all of these protest movements were first and foremost lauded for their ability to overcome entrenched regimes that seemed more interested in personal enrichment and cronyism than functional governance. As it turned out, none of the ‘revolutionary’ movements created great governing regimes themselves, with a few even ending up victims of additional revolutions later on. The Maidan revolution is quite different from this 21st century Western academic trend of analytic largesse, however, in that there was a geopolitically powerful neighbor right next to the revolution that happened to have a very great interest in how things evolved. Think on it: in the aforementioned revolutions there was either no strong power nearby deeply interested in how affairs on the ground played out or the strongest power was the United States from a great distance just hoping an autocratic regime would fall one way or another. In the Maidan revolution this was not the case: Russia was very much interested in the long-term geostrategic consequences of regime change, and it was the blind laziness of Western academia that simply missed the obvious reasons as to why that would be so. Or, again, because of an intellectual presumptuousness that had come to afflict most Western scholars to believe any toppling of a crony-like regime would only be applauded by all players, regardless of long-term consequences. To this day you will be hard-pressed to find much Western media/academic coverage analyzing or considering legitimate Russian interests in long-term Ukrainian political affairs. Those responsible for leading the Maidan revolution were equally blind or presumptuous: while they are quick to lay blame on Russia now, it is obvious going back two months that they were completely caught unaware and off-guard that anyone on the outside would have words or actions for their behavior other than simple congratulatory phone calls. Obviously, this has proven to be a rather large mistake. A second aspect to play out from the Maidan revolution (the Crimean referendum) is also rather unique and an academic ‘special case study’ worthy of greater attention that as of yet has failed to be recognized here in the West. Most of our studies dealing with regions trying to secede tend to be examples of true secessionist activity, ie, the region wants to become its own country. Crimea not only went against trend, in that it wanted to join another country instead, it went far against trend by wanting to join a country that was superior to the original host country in every political, financial, military, and geostrategic way. Just because no one talks about it doesn’t eliminate its crucial relevance: what is one to do when a region with a long history, ethnic connection, cultural ties, and geostrategic relevance to a larger, more powerful, more rich country next door wants to leave the chaos of its current host nation for the more peaceful pastures of the bigger, badder brother? As far as I can tell most in the West bypass this question by focusing on concepts like ‘territorial integrity’ and ‘national sovereignty,’ when we all know these concepts, though undoubtedly sound and unoffending, are not exactly universally ACTED upon. They are universally SPOKEN about, but not always universally SUPPORTED. Not in all cases and not even by the United States. So I am not sure if I should be so stunned or bothered by the fact that Russia might not either. Indeed, one can feel sorry for Ukraine. It has been dealt a rather bad hand. One it could never have expected as the reveling on Maidan Square took place so many weeks ago. But the people of Crimea, and in turn now the people of Eastern Ukraine and Odessa, seem to be basically saying, ‘You can have your traditions of international law for all we care. What we really want are the traditions of international DATING, ie, why should we be forced to keep dancing with the partner we don’t want when the partner we truly want to dance with is standing there waiting to tango?’ As silly as that analogy may seem, its logic makes more sense to the people of Eastern Ukraine today than any discussion about territorial integrity and national sovereignty. If these regions were looking to become independent states, then it would indeed be a biting criticism if asked: aren’t you better off remaining a part of Ukraine? But what is the answer to the question these regions actually want posed: aren’t you better off becoming a part of the Russian Federation? Just because the West and Kiev wants that question obliterated from the news doesn’t mean it is any less relevant to the actual people in the eastern half of the country. And so here we sit. Eastern Ukraine remains unsettled. More casualties mount. Accusations fly about Russian subterfuge as authorities in Kiev violently struggle to preserve its larger territorial mass. How it will all play out, for better or for worse, is beyond anyone’s guess. But in the meantime I will wonder if this Ukrainian revolution, the Maidan revolution, might not end up setting a very unique precedent for all future revolutions moving forward: namely, be careful what you wish for and don’t count your chickens before they hatch. It is indeed a treasure trove of academic trend-setting. It just seems to be of a kind no one in the West wants to recognize.